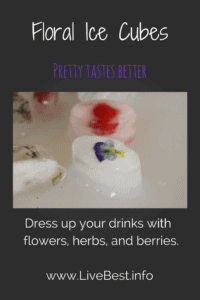 Flowers, herbs, berries…ice cubes are an easy way to pretty up margaritas, daiquiris, mojitos or non-alcoholic drinks. Pretty seems to taste better. 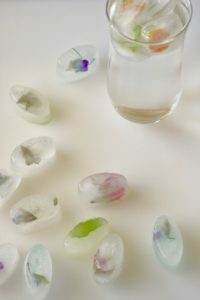 These floral cubes are cool!! A hot August day had me looking for some relief. I found it in the garden and an ice cube tray. 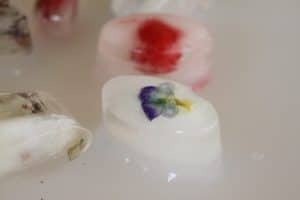 Earlier in the day, I picked flowers, berries and herbs from my yard that provided flavor and color for the cubes. Lavender, rosemary, thyme, mint, raspberries, roses, geraniums, and Johnny-jump-ups are just a few of the possibilities that are safe and edible to use in cooking. But there are lots more options. Find some here by the North Carolina State University Cooperative Extension. 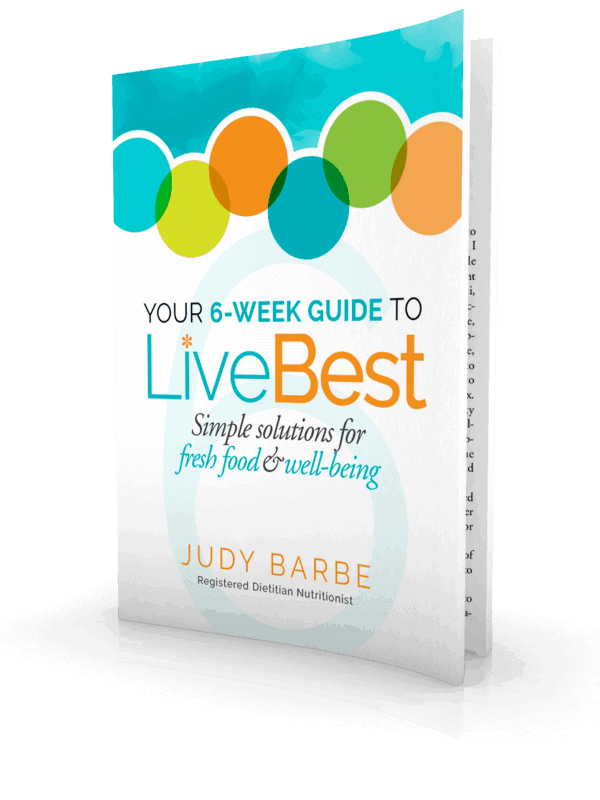 Use plants with either no pesticides or only pesticides labeled for edible crops and without the application of animal manure to the surrounding soil in the past four months. Gently rinse your leaves and berries with water. 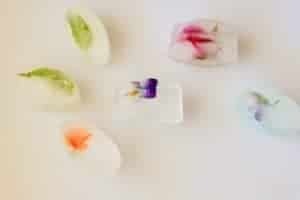 Place a sprig, leaf or flower face down in the ice cube tray. Pour just enough water in to hold it. Freeze for 30 minutes or so. Add more water, freeze. 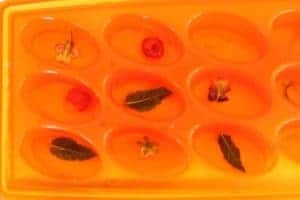 Depending on the size of the plant piece, you may do it in thirds to fill the ice cube tray. This silicon-bottomed ice cube tray is what I use to make ice cubes. I like the small size, but more, I like the flexible bottom that makes popping out a cube super easy. 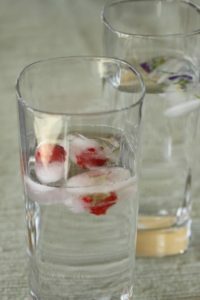 The little flavor boosts may entice a few more sips of water which is a good thing as we sweat out the summer heat. Kids will like finding something at the bottom of the glass. Too pretty to eat? No way! 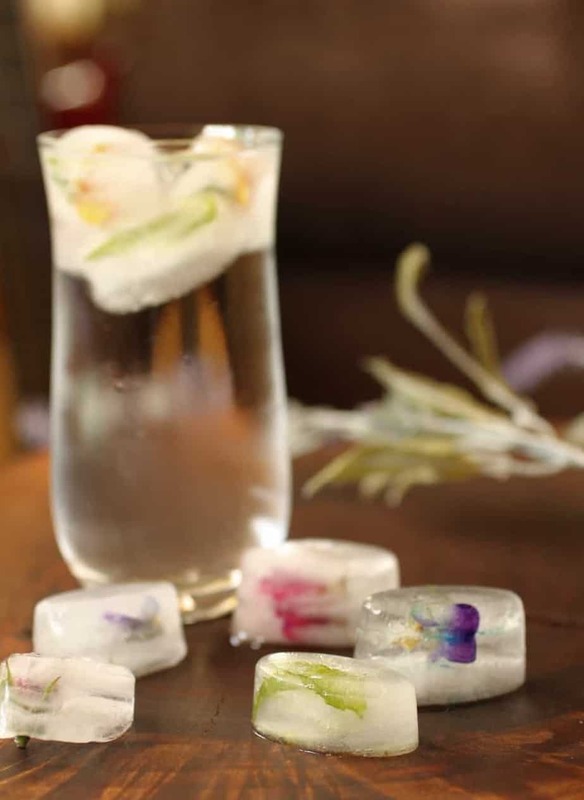 I served these to guests and some plopped them in a glass of wine, some enhanced a gin tonic, and others flavored water, both sparkling and still. 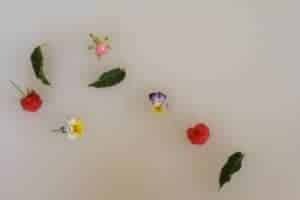 The decoration was unexpected, inexpensive and pretty. Another way to cool off with flavor? Think these would be a great addition to sangria. This post includes an Amazon Affliate link, which means that if you purchase a product by clicking on the link, I get a small portion of the proceeds. Your price does not change. Very clever ideas- thank you!